Leicester is a large East Midlands city which developed on the back of industrialisation during the Victorian era. Walking along most of the streets in the city centre you might think you could be in any number of similar cities in the UK. Chain store shop fronts mixed in with a few independents. However, stop and look up. Like those other cities, Leicester has a wealth of interesting and unusual architecture. Here is one of my favourites, on Market Street, now pedestrianised and ideal for taking a minute or two to appreciate your surroundings. 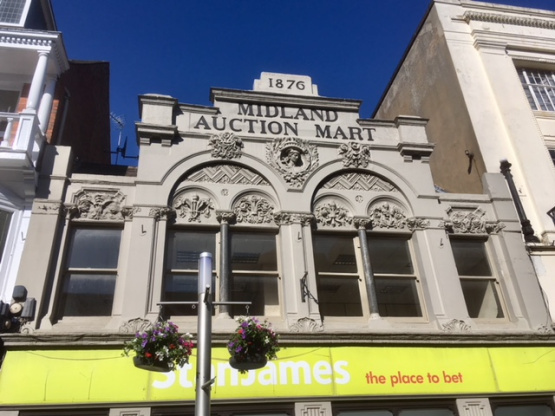 Here is over the bookmakers shop (now closed down) is the very ornate Midland Auction Mart dating from 1876.